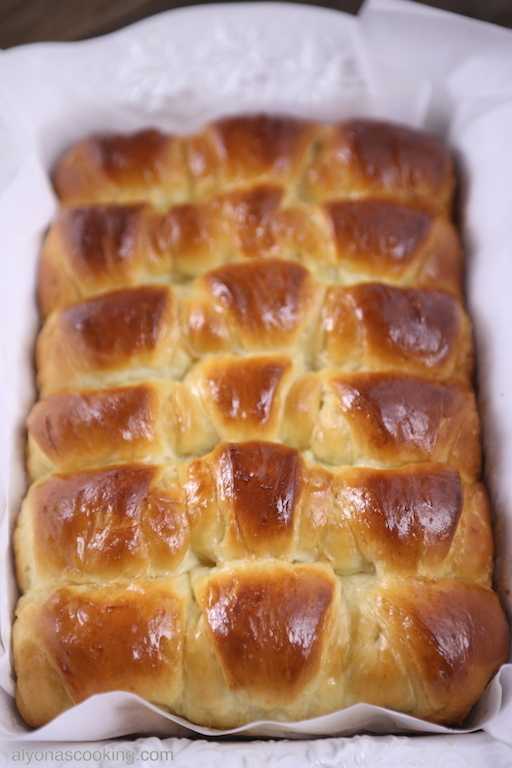 These baked piroshki, bulochki, (булочки), sweet filled buns, however you have been used to pronounce these sweet yeast pastries, are one of my mothers highly requested recipes. 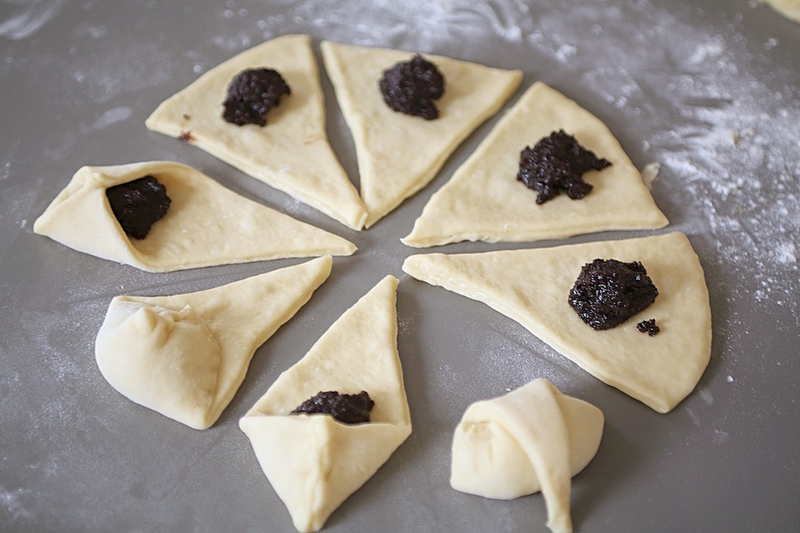 This baked piroshki recipe is our families favorite. My mother has mentioned that almost anyone who has tried her baked piroshki, asks her for the recipe. I can see why, because she makes delicious bulochki. 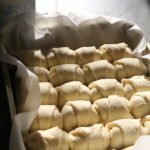 They happen to be favored by almost everyone who has tried them, and she has even been asked to make these for a few weddings before. My mother usually makes her portions by liters which is fine too, as this freezes very well, but I decided to cut the recipe in half which works great for our family, leaving some leftovers. If you can find vanilla sugar (also called “vanillin”), I recommend it because this is what gives these buns that sweet bready aroma. NOTE: I happened to use Natasha’s Kitchen rolling technique for these baked piroshki (crescent-shaped buns) which I happen to love, thank you, Natasha! 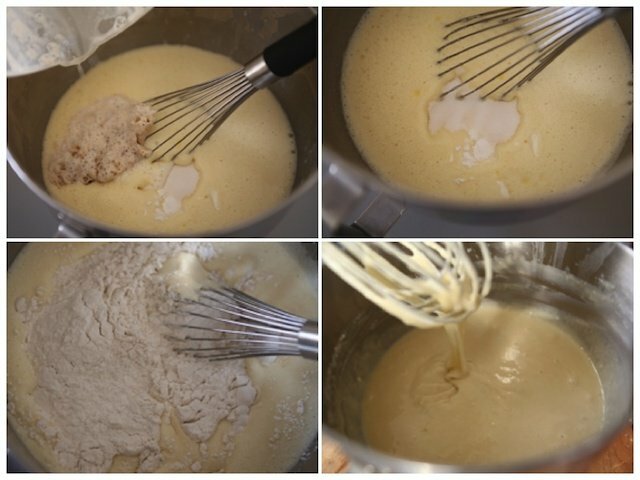 To begin, place three eggs and 1 cup of sugar into the bowl of a stand mixer; beat on high speed until thick and pale (about 3 min). 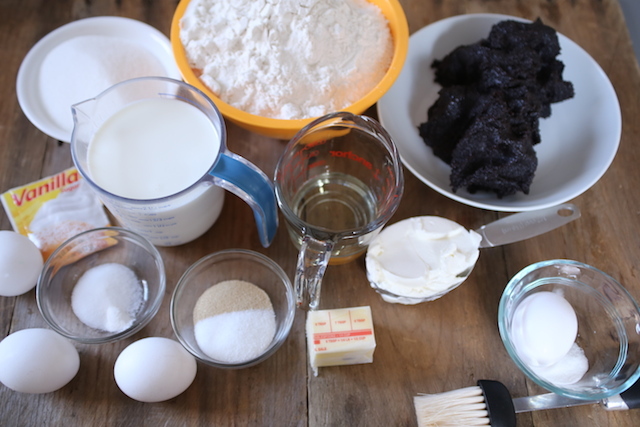 Add 1 cup of flour to the beaten eggs and mix over medium speed. With the mixer still running slowly pour in the steaming hot milk and mix for about a minute. Cover and allow to sit for 15 min. NOTE: Adding steaming hot milk to the egg mixture helps the piroshki not to get stale so fast. Only be sure to add it slowly to the batter. Heat remaining 1 cup of milk in a microwave for about 1 minute. Milk should be warm, NOT hot; if you stick your finger in the milk, it should feel a little warmer than lukewarm. Not by any means hot. Add 1 tbsp of dry yeast and 1 tbsp of sugar; stir and allow to sit for 15 min. 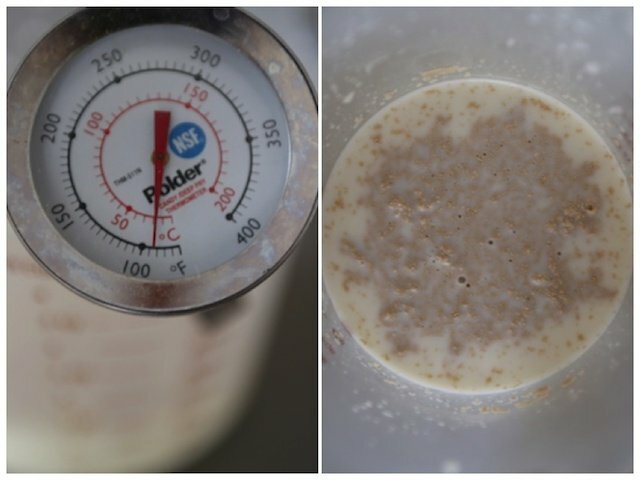 Milk should be 80-90 degrees F when using a thermometer. 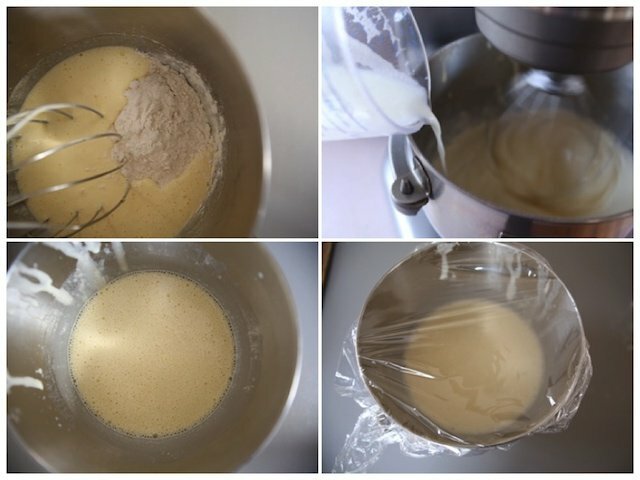 After 15 minutes add the yeast mixture to the egg mixture. Then add 1/4 tsp baking powder, 1 tsp vanilla sugar, 1 1/2 tsp salt, 1 cup sour cream, and 2 1/2 cups flour; whisk well. Cover and allow to sit for 45 minutes. After 45 minutes add 3 cups of flour and 1/3 cup of oil. 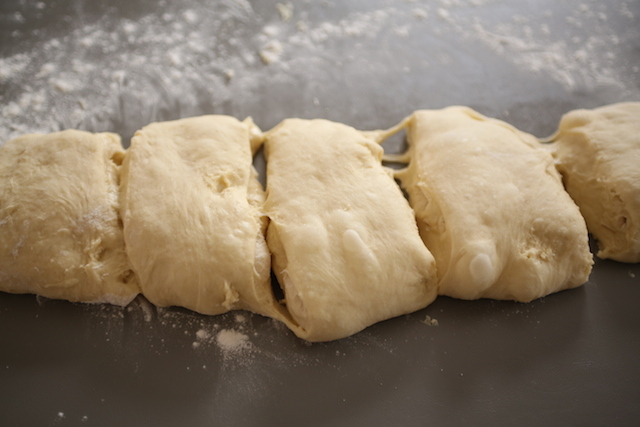 Knead over low-speed for 10 minutes, adding remaining 1/4 cup of flour towards the end. Cover bowl and allow to rise for 2 hours or until the dough has doubled in size. NOTE: The dough will be slightly sticky/tacky. Do not fret after rising it will be perfect to work with as you will be dusting more flour during the rolling process anyways. 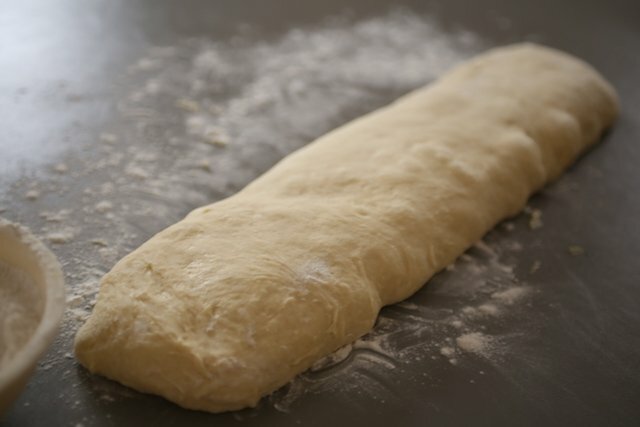 Once the dough has risen and doubled in size; remove onto a well-floured surface. Form dough into a 20″ log and cut into five equal pieces. Working with one piece at a time, shape into a ball by flipping over and pinching down all sides. Roll out into a 12″ circle and using a pizza cutter slice dough into eight equal pieces. Place one heaping tsp of filling into the broadest part of the triangle. Seal filling by pinching down the sides and top. Once the mixture is sealed lightly fold over the flap and pinch the very end to the bottom of the bun. 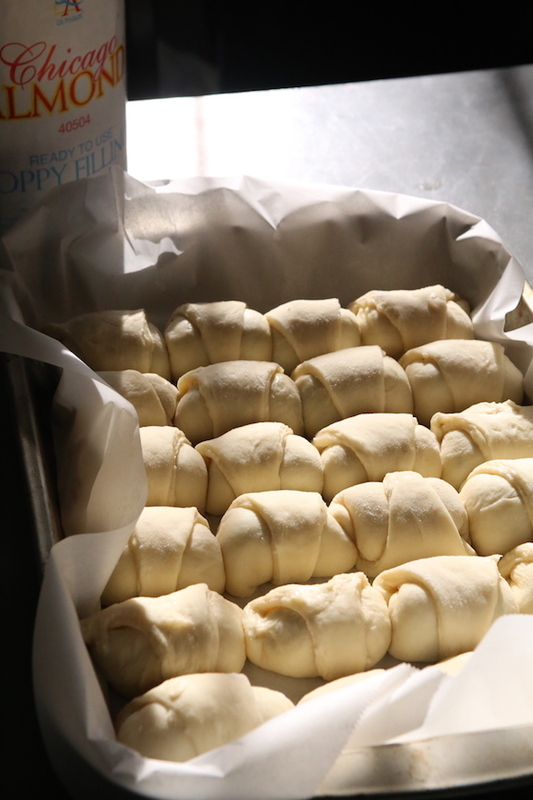 Line two 13″ by 9″ pans with parchment paper and transfer rolled buns into the pan. You should have about three rows down on each pan. Allow prepared bulochki to rise in a warm place for 1 hour, covered. 11. Preheat the oven to 350 degrees F. Brush with beaten egg wash over the top. Then, bake for 35-40 minutes, rotating if necessary. 12. In the end, dissolve 2 tbsp of sugar in 1/4 cup of water in a small bowl and brush over hot buns. 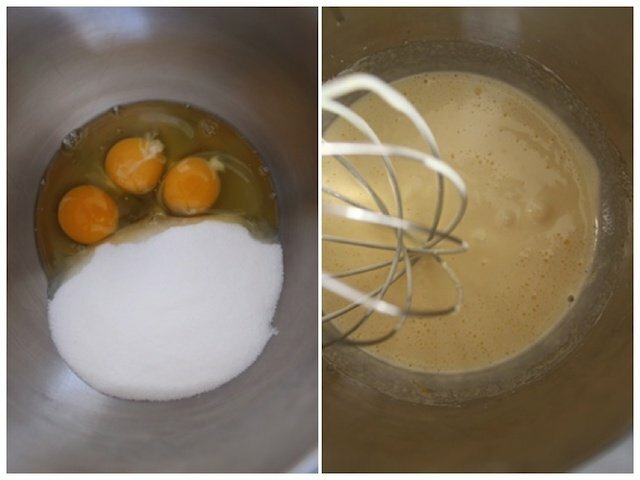 Place 3 eggs and 1 cup of sugar into the bowl of a stand mixer; beat on high speed until thick and pale (about 3 min). 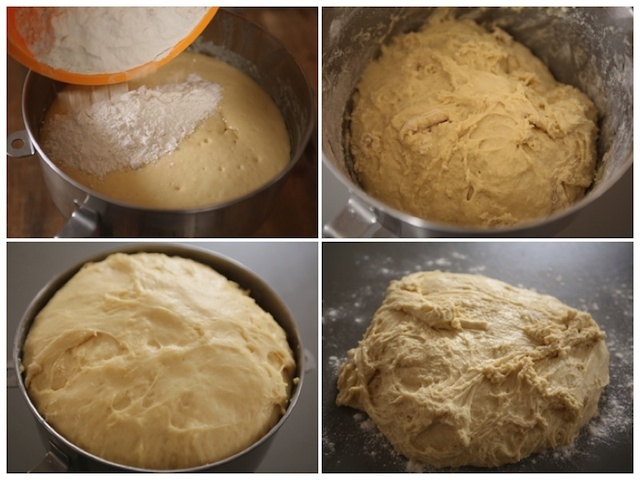 Once the dough has risen and doubled in size; remove onto a well-floured surface. Form dough into a 20" log and cut into five equal pieces. Working with one piece at a time, shape into a ball by flipping over and pinching down all sides. Roll out into a 12" circle and using a pizza cutter slice dough into eight equal pieces. Line two 13" by 9" pans with parchment paper and transfer rolled buns into the pan. You should have about three rows down on each pan. Allow prepared bulochki to rise in a warm place for 1 hour, covered. Preheat the oven to 350 degrees F. Brush with beaten egg wash over the top. Bake for 35-40 minutes, rotating if necessary. Dissolve 2 tbsp of sugar in 1/4 cup of water in a small bowl and brush over hot buns. These Bulochki are my absolute favorite. The only problem I have with this kind , I can not stop eating, they are that good! Mmm love bulochki. Especially with poppyseed filling. Where did you buy ready poppyseed filling? Really good question, vika!My aunt lives in Wisconsin and buys big cans of this AMAZING poppy seed filling! You can literally eat it from the can, by spoon its that good. It creamy, sweet and really really good. Here is a direct link to the exact kind that I use; https://www.roundeyesupply.com/Henry-and-Henry-Butter-Heavy-Duty-Poppy-22-Lb-p/de404002.htm?gclid=Cj0KCQiA-JXiBRCpARIsAGqF8wXnDz7JloeaENGkNddEby0HrnUOjZzsEenegpMAvmW4f587DZ3sKLYaAjV-EALw_wcB&Click=7195 The can is big but I freeze mine after opening. It freezes very well (you can still scoop the filling out frozen, poppy seeds won’t freeze to a block) that way you can use it when needed. Let me know if you ever find this poppy seed filling else where.